We have built up a reputation for quality, safety and service which is envied by our competition and applauded by our customers. We supply and erect scaffold for projects of all sizes whether it be the front of a house, or a whole block of flats, no job is literally too big or too small. The very high standard we set ourselves for quality materials and safety has earned us approval with many large commercial site contractors throughout the South, the South West and Wales, including Railtrack though to local contractors and businesses. You are an important customer to us regardless of the size of your project it could be to replace gutters, build a house, extension or to construct a new hotel or city apartment block. We treat and respect all our customers equally and above all you will always be valued. We offer a complete scaffolding contract service from initial enquiry through to monthly valuations, a design service for specialist work and a weekly inspection service if required. We always take time to understand the needs of our customers and never forget that you as a repeat customer or someone who would recommend us are the future of our business, the key reason that over 70% of our business is repeat customers or through a recommendation. 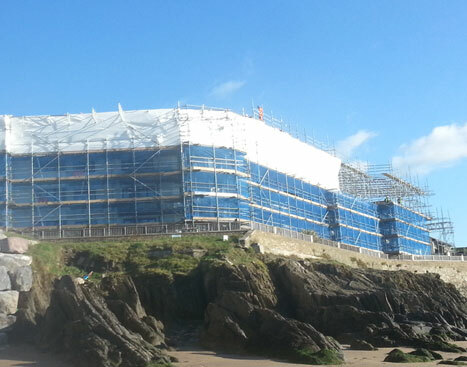 Scaffolding for any Commercial project across the South West. Our bespoke temporary roofs are able to be created for buildings and structures of any shape, size and dimension as our temporary roof scaffolders have many years of experience in this area of scaffolding. 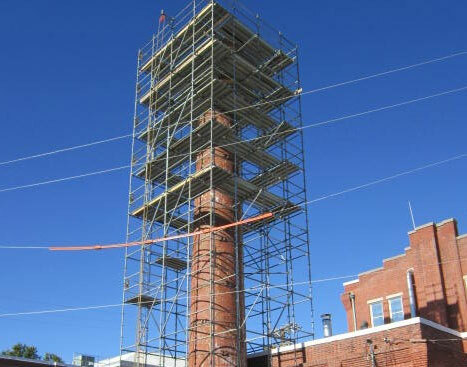 Chimney scaffolding, just like the chimneys themselves, come in all shapes and sizes and are largely dependant on the type of property and the type of repairs and materials that are required. 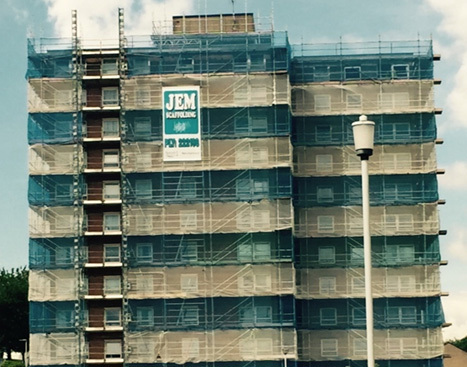 Jem Scaffolding are leaders in the field providing bespoke structures that are safe and secure to not only allow access, but also carry out repairs. 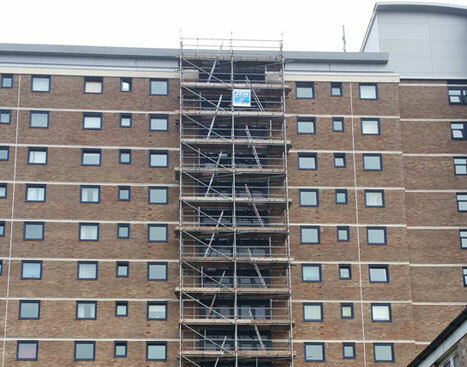 Our highly skilled scaffolders, competitive pricing and attention to detail has positioned us as a company used not only by property developers and tradesmen, but also homeowners and the domestic market. Whether you're looking to replace the chimney flashing or a complete chimney rebuild, Jem Scaffolding can provide you with a safe and secure chimney scaffold to complete the job. Edge protection comes in many forms and Jem Scaffolding can provide solutions to all problems concerning protection of ﬂoor or roof edges where there is danger of people or materials falling from height. 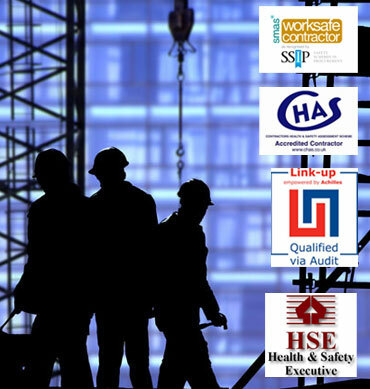 Falls from height amount to the largest number of incidents and accidents irrespective of the type of industry involved. 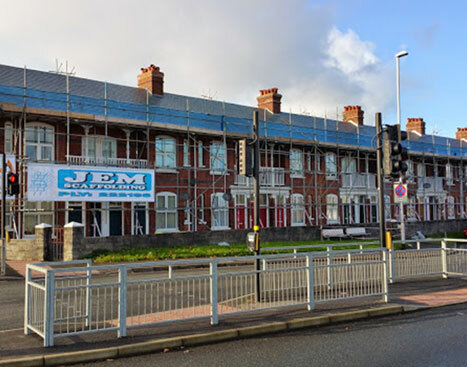 Jem Scaffolding are experts with Edge Protection Scaffolding and can provide bespoke solutions for existing buildings giving protection around roofs or plant areas on the roof. Our systems are non invasive and sit on the existing roof surface. We also provide temporary solutions to construction and other sites where protection may be required, for example ﬂoor edges. These can be formed with either scaffold tube and ﬁttings or pre fabricated panels either bolted to timber, steel or concrete frames. Scaffolding work on bridges and viaducts brings its own unique set of challenges, not least of which is working at height. 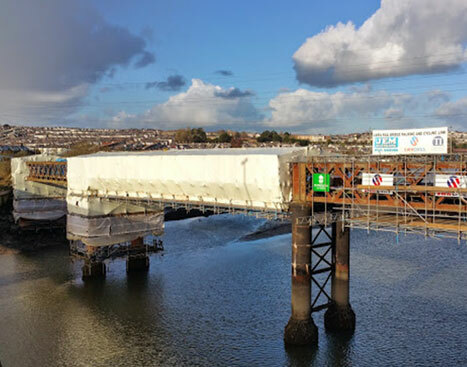 Jem Scaffolding has worked on a variety of bridge and viaduct projects right across the South West and works closely with Link-up for Railway Bridge scaffolding Projects. Incorporating Encapsulation Scaffolding for full boarded access to the bridge to allow inspection and repair, sandblasting and painting. If you have ever worked on a construction site then you will know that there are an array of risks involved, especially when working at heights. Why not help protect the safety and wellbeing of your employees and those below with our safety netting options. A full and comprehensive Protection & Debris Netting service is available to suit your requirements in a wide range of materials including plywood, flame retardant polythene, Profile steel cladding, call us now to discuss your requirement, what ever your needs are. Our clientele is diverse, ranging from window cleaners, builders, architects, security companies, painting contractors, railway companies and many other sectors. Whatever working environment you require access solutions for, we will have the knowledge and experience to match you with the perfect access tower for the job. 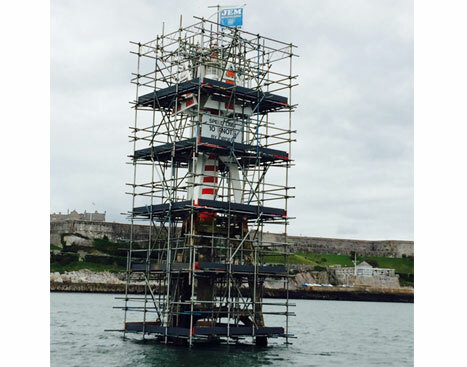 Jem Scaffolding have been supplying the highest quality access equipment to commercial, industrial and domestic customers throughout Plymouth, Devon and Cornwall for more than 30 years. Please call to find out how we could help with your project, from painting and decorating access, to architectural inspection, construction or general security work, with our knowledge and experience you can be assured of an access solution to meet your requirements exactly.